Honda will be featuring a number of new models at the Tokyo Motor Salon and will unveil the new CR-Z Mugen RZ production model and S2000 Modulo Climax concept. Honda has announced their lineup at the 2013 Tokyo Motor Salon that will start on January 11th, 2013 in Tokyo. Honda will showcase some of their latest models and also some exciting new concept vehicles. Honda will bring a full lineup of products and will feature at the show everything from new production vehicles, concept models, racing vehicles, motorcycles and power products. Featured at the show will be models like the N-ONE Modulo Style that is based on the all-new N-ONE mini-vehicle. Honda will also be unveiling the MUGEN Racing N-ONE Concept model manufactured by MUGEN and a model created in collaboration with the Japan Nailist Association (JNA). The new model will show off a custom body with unique colors and it will be adorned in rhinestones. Honda will also be displaying 10 fun mini-vehicles with all their variety, including show models of the VAMOS and the ACTY TRUCK. The star of the show at the Honda automobile exhibit could be the S2000 Modulo Climax concept model which is based on the S2000. The concept car will feature a cutting-edge aerodynamic design and a “chic interior” with a black and burgundy color scheme. A new limited-production vehicle will be unveiled at the show called the CR-Z MUGEN RZ that is built by MUGEN and the new car will be a production vehicle that will be limited to just 300 examples. Also on display will be the MUGEN CR-V Design Study, a CR-V-based concept model presenting a new design language from Honda. Honda will also feature a racing vehicle exhibit that will display two cars from the Super GT Series, the HSV-010 GT and the MUGEN CR-Z GT. Also showing will be the Docomo Team Dandelion Racing machine that won the 2012 Formula Nippon team championship. Honda will be showcasing some racing motorcycles at the racing exhibit and will present the RC213V motorcycle, which contributed to Honda’s team and constructors’ championships in the 2012 MotoGP, the highest class in the Road Racing World Championship Grand Prix. Honda will also include a motorcycle exhibit that will feature the Goldwing F6B that is planned for commercial production. The bike was unveiled at EICMA 2012 (70th International Motorcycle Exhibition) in Italy in November. Customized motorcycles derived from such models as the CB1300 Super Four ABS Special Edition and the NC700X will also be on display featuring custom parts and accessories. 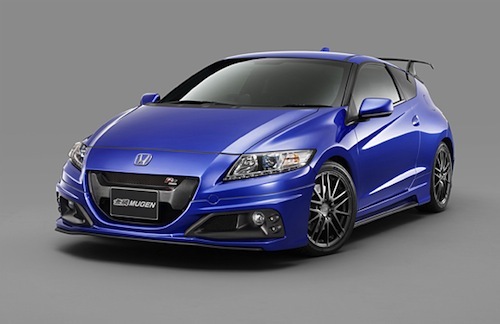 Honda will be showcasing the S2000 Modulo Climax and CR-Z Mugen RZ along with a full compliment of production cars, concept vehicles and motorcycles at the 2013 Tokyo Auto Salon next month.